If you’re feeling a little whimsical and would like to break a couple of typical wedding traditions, then why not consider ditching that hefty bunch of flowers for something a little more fun to walk down the aisle with? Perhaps you are allergic to flowers and don’t quite trust your allergy meds to keep you safe / un-drowsy, maybe you don’t like flowers or maybe you just like keeping things fresh and unique. Whatever the reason, letting go of the idea of using fresh flowers for your bouquet opens up a whole other world of possibility. Here are a couple of ideas to take to the bouquet bank. If it is the simple act of carrying a bouquet that bugs you, why not opt for a simple, elegant corsage instead? You can easily have one made to match the groom’s boutonniere. One of the coolest bouquet alternatives is the beaded bouquet. The nice thing about beaded bouquets is that they bring a bit of a Fairy Princess feel to the completed bridal ensemble, especially if you choose to use clear crystal-type beads and design them in a way that they work like a sort of hand-held fountain. You can make these bouquets yourself or you can contact a place like Beaded Bouquets and have them design something to match your theme and colours. A very cutesy trend at the moment is to walk down the aisle with a bunch of button flowers. These you can either make yourself, or you can have a get together with your bridal party one night and make it together using different buttons in matching colours. A lot of brides are wearing feathers in their hair these days, so why not round off the look with a nice bouquet of feathers? 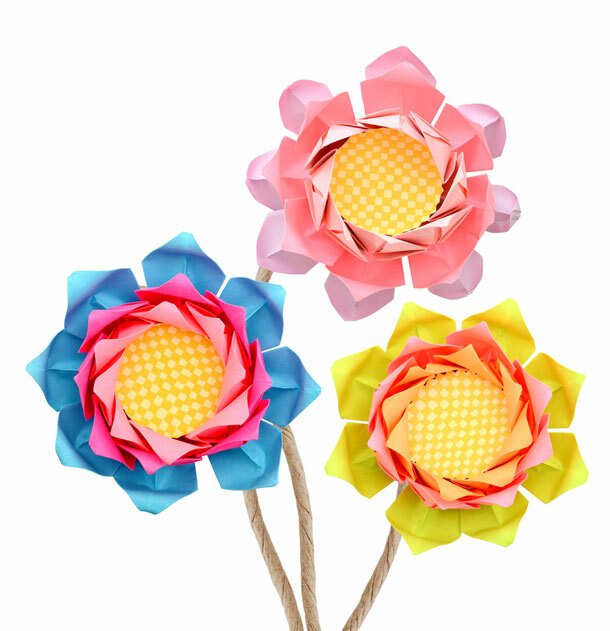 For a particularly quirky option why not use a gorgeously crafted hand-held fan instead of a bulky bunch of flowers? This option is pretty fail-safe as you don’t have to worry about putting anything together. Beautiful bouquets can be constructed from any kind of paper, from handcrafted prints to simple newsprint. All you need is a little know-how and some time to put it all together. You can either make a bouquet of small paper flowers, or construct one or two huge paper flowers for a simple but effective option. For a fun Autumn-themed wedding you might consider walking down the aisle with a bouquet of pinecones, wheat or cotton tufts. Sounds crazy, but come on honey! Just a little imagination and the right setting and these seemingly simple alternatives can look pretty fab! Of course if you’re looking for the height of cutesy-quirky then you might consider walking down the aisle with a giant colourful pinwheel. Why? Because it’s crazy – and sometimes we like crazy! Pinwheels are relatively easy to make yourself. Use a bit of construction paper, or even better, scrap book paper to create your wheel, and attach it to a nice ribbon-decorated dowel. Viola! Crazy quirky bride! Can you please tell me who can help me with beaded bouquets for my daughter’s bridesmaids?